Before cows ever came to the Americas, 60 million buffalo roamed freely on the Great Plains, but were almost extinct in the late 1800’s by Euro-Americans. Today, there are 200,000 buffalo that are mainly raised in ranches and in National Parks such as Yellowstone and the Custer State Park in South Dakota. This is a result of the realization of how important the buffalo is to the Great Plains ecology, Native American diet and their former way of life. 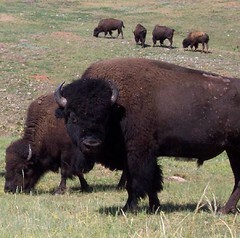 Buffalo have been roaming the Great Plains for 10,000 years and have evolved and adapted to the Climate. Their thick hair ensures they have no problem surviving the winter. They have quick reflexes; they are fast, muscular and are very difficult to kill. According to Ernest Callenbach in his book “Bringing back the Buffalo!”, they have no problem finding grass whether in dry years or blizzards. Cattle, on the other hand, have very weak immune systems and do not have the adequate covering for the cold winters that the plains experience. Cattle ranchers’ loose profit when they lose cattle due to harsh winters and infections. To ensure that their cattle survive, cows need antibiotics. When the cow is processed, then sold on the market, consumers not only ingest unhealthy, fatty, red meat but also the antibiotics. Too much antibiotics consumed by a human being weakens their bodies ability to fight infectious diseases. The immune system is like a muscle and needs to be exercised in order to get stronger. When antibiotics are involved, the immune system doesn’t get the chance to build up because the drug is doing all the work. In other words, the human body becomes dependant on the antibiotics. Many different Native American tribes depended on the buffalo. Their diet was built on it for thousands of years. The reason for the high diabetes rate among Native Americans today is due to the lack of buffalo in their diet and consumption of “American” food that is non-native to their digestive system. However, not only is buffalo essential to the Native Americans diet, it is healthier for everyone in general, compared to cow. Before food was capitalized, the plains natives had no problem feeding themselves because they were skilled buffalo hunters even before horses ever came to America. They also never wasted any part of the buffalo after the meat was eaten. The skulls were used for ceremonial purposes, the bones for utensils and the hide for clothing and shelter. The Buffalo council is an RSO at Fort Lewis College and demonstrates the role of the buffalo to Native American way of life by hosting a buffalo feast annually. You can contact Clarence Smith at casmith@fortlewis.edu for further information.